Would You Like to See This Happen at Noel? Here are this weeks sites for you to visit and leave a comment on. Now that internet access has been fixed we will be able to create our own blog posts on Friday at our Ning. Tuesday we will set aside some time for getting gmail addresses. Wednesday we will get you added to the ning. 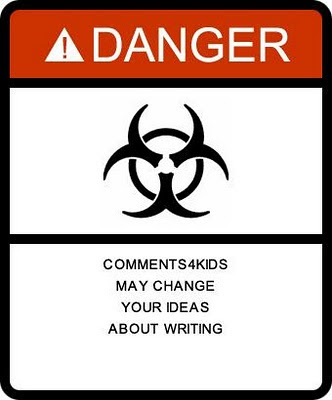 Friday you will write a post on your experiences with #comments4kids. 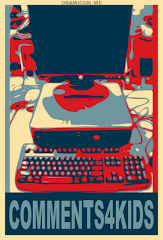 This means you must comment on each of these posts! Pick your favorite water color and leave the artist a positive comment. Tell him or her why it is your favorite. Japati is in a class that is similar to our kindergarten. He is reading a story he wrote himself. Notice the confidence in his reading and his clear speaking voice. Leave a comment congratulating him on being a confident reader. Rachel is one of my friends from China. She has been blogging for a couple years now. I chose this post because she had to explain how she created the artwork. Leave her a positive comment. Tiffany is another friend from China. She found this video on her school portal. Does the video have a message? Leave a comment about the video. This class creates podcasts. Listen to this one (you will need headphones) and leave a comment. Is this an effective way to show how to do math? Who would learn the math better, the students that created the podcast or the students that listen to it? 1. What ages is this appropriate for? 2. How safe is this game for children? 3. How fun is the site? Finally, you will either recommend this site or not recommend it. 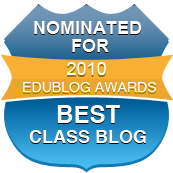 I plan to introduce this site to our fourth grade in April if you find it meets our requirements. Students, welcome to the activity I call Comments4Kids. Here is a link to the post that started the activity. Here is a link to Robert explaining why commenting is important for both the student that wrote the post as well as you, the commenter. 1. Keep the commenting positive. 2. Keep the comments relevant to the post. 3. 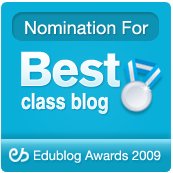 Link back to the class blog. Mrs. Goerned teaches 6th grade students in Iowa. Her students have written poetry and would like some comments. Remember, poetry is very personal so be careful with your comments. Pick one (or more) post on each page to leave a comment. Since you have expressed how much you have missed Mr. McClung (I can't imagine why ;), I have included his class blog this week. This time your comment does not have to be relevant to the post. On Friday you will be writing about your experience commenting on blog posts this week. 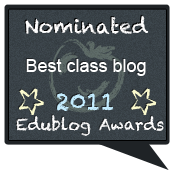 I may even have a few of you record your experiences to post on the class blog. Make sure you can explain what you commented on and how the experience has changed you as a writer! As you can see from the pictures my classroom (lab) is full of promise. I have computers that need to be networked in classrooms throughout the building. Unfortunately there are so many I don't have a clue where to begin. I know, this is a good problem to have! 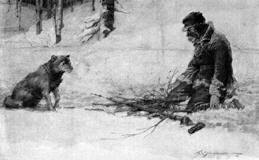 To Build a Fire is a short story by Jack London. London liked to show the conflict between man and nature. Read the story and think about what point London is trying to make. After you have read the story, I want you to choose a new way to retell the story. Pick a digital tool we have used before and freshen up the tale. Make sure the plot remains, we don't want to write a new story.